The reflection on what the philosopher Nassim Taleb calls the insurance policy against an Orwellian future is expanding. This January 3, 2019 marked the 10 years of operation of the blockchain Bitcoin. The first listing of the BTC in dollars took place a few months after its birth on October 5, 2009. At the time, 1 USD was worth 1,309 BTC. Today, it takes $ 3,800 to buy 1 BTC. In other words, for every dollar spent on BTC at the time you would have $ 4,974,000 today. After ten years of existence, Bitcoin continues to gain popularity. In recent days, an article on Bitcoin has attracted a lot of attention. It is that of the very famous Antony Robbins, international speaker, pioneer of motivation coaching and multimillionaire. He is also known for his advice on finance and wealth management. "Bitcoin is decentralized. No bank, government, company, or person owns or controls the network. This means that your accounts can never be frozen, that a government can not devalue the currency and that it can be used in any country. " 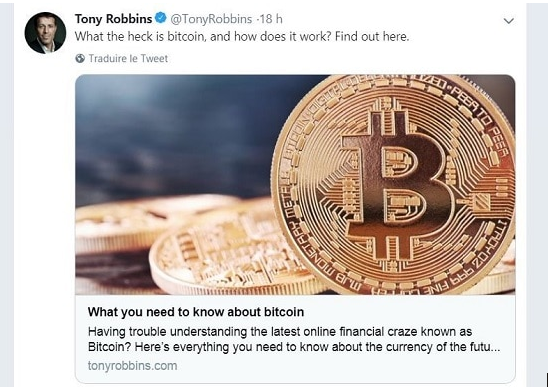 Although this was his first article about Bitcoin, Robbins had spoken about it last year as a futile game and a simple bet. He told CNBC: " I think that [Bitcoin] is very fishy. I've no idea. It's like I'm going to Las Vegas ". A year later, he seems to take things a lot more seriously, probably because his clientele is also very interested. Bitcoin already has its professional speakers. The best known, Andreas Antonopoulos, travels the world speaking to the public about the nature and importance of Bitcoin. His book Bitcoin Mastering is considered one of the most important on the subject. 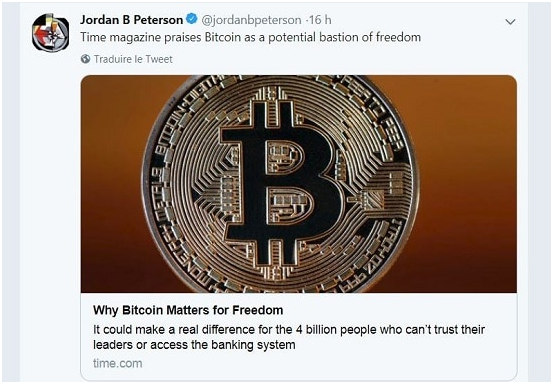 In recent days, we have also seen the famous Canadian psychologist Jordan Peterson publish a tweet praising Bitcoin through an article from Time magazine. Peterson is the author of the bestseller 12 Rules For Life (translate in French : 12 rules for a life. An antidote to chaos) and has nearly two million subscribers on its Youtube channel. The article is entitled: "Why Bitcoin is important for freedom". He recalls that four billion people in the world can not trust their leaders or simply access the banking system. Venezuela is not the only place where people can use Bitcoin as a refuge. In China, Xi Jinping can track all your transactions on Alipay and WePay, but he can not orchestrate mass surveillance on all Bitcoin payments. In Russia, Vladimir Putin can target an NGO and freeze his bank account, but he can not freeze his wallet Bitcoin. In a refugee camp, you may not be able to access a bank, but as long as you can find an internet connection, you can receive bitcoin without asking permission and without having to prove your identity. By the way, Jordan Peterson decided to abandon the Patreon system because of political censorship. But donations via Patreon are one of the main sources of income for many influencers like him. He is now working on creating his own online platform to accept donations from his readers and listeners. And to avoid relying on trusted third parties like banks, which is a risk, he announced that he would accept donations in bitcoins. With a simple Bitcoin address, it is indeed possible to receive any donation, from anyone around the world, without going through a third party. As the philosopher and former trader Nassim Nicholas Taleb wrote, Bitcoin is "An insurance policy that reminds states that they no longer have a monopoly on the last object that the establishment controls, in this case money. For us who constitute the mass, this is an insurance policy against an Orwellian future. " 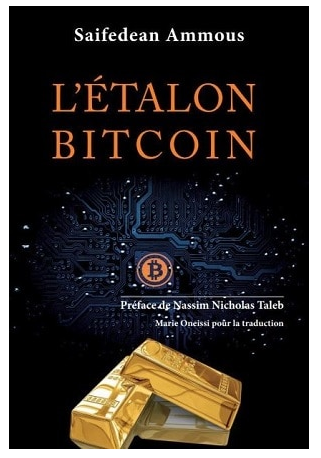 It is precisely Taleb who prefaced The Bitcoin Standard, the book of the economist Saifedean Ammous, which has just been translated into French under the title: The bitcoin stallion (Dicoland, 2018). This book is not only an indispensable guide to understand Bitcoin but also and especially a book to address the stakes of the currency from the point of view of the Austrian School of Economics to which the author refers constantly. "If Bitcoin is an innovation of the digital age, the problem it seeks to solve is as old as the world: how to transfer value in time and space. The author paints a fascinating picture of the technologies of money from the primitive systems to the present day against the backdrop of this constant question: what are the characteristics of a good currency and its consequences for peace, trade, culture, art and capital accumulation. It comes to Bitcoin which, by its characteristics of apolitical digital cash, defies the best protected state monopoly. The author advocates iconoclastic ideas on Bitcoin as on the bank and gives a real lesson of economy by developing in readable terms the concepts of reserve of value, temporal preference, stock-to-flow ratio, digital rarity, etc. An indispensable book for anyone seeking to understand this new digital currency as well as for economics students, teachers and financiers. "